If the holidays are the time for indulging (which they are) then post-holiday season is the time for a detox. There’s no need to feel guilty about an over-filled plate at Christmas dinner or a few too many gingerbread cookies and cups of eggnog throughout the month of December. This is the one time of year when it’s totally acceptable to over-indulge. So why wouldn’t we? While seasonal desserts and cocktails may seem like a great idea at the time, eventually your body will start to slow down and feel sluggish. So as we head into the New Year, it’s the perfect time to kick our health and exercise regimes into high gear. Starting the New Year off with a good detox will help pave the way for the rest of the year and allow you to head into 2016 with a healthy outlook. One of the best ways to detox your body is through certain yoga poses that help with digestion, circulation and energy levels. These poses rid your body of toxins as they stimulate your circulatory, digestive, and lymphatic systems. 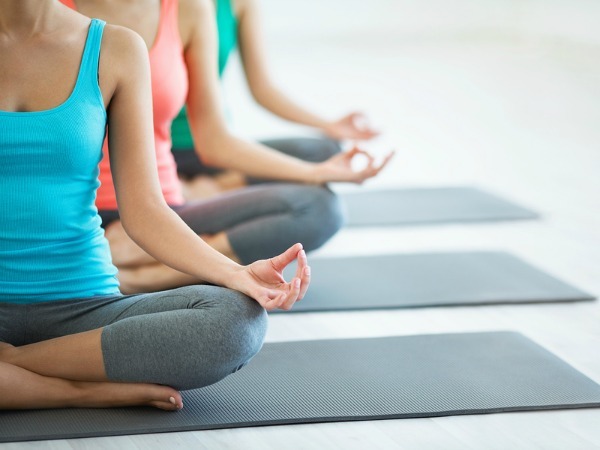 Yoga also helps to detox your mind and emotional toxicity, as well as aiding in healthy sleep patterns. So whether you hop on over to your local yoga studio to practice, or pull out your yoga mat in the comfort of your own home, do these 4 yoga poses to detox your way into a very healthy New Year. How it works: As well as strengthening your quads and glutes, this pose puts gentle pressure on your kidneys, liver and spleen to aid in digestion and release toxins. It also stimulates the heart, kick-starting circulation in the blood, respiratory and lymphatic systems. How to do it: From Chair Pose, bring your hands together over your heart. Take a big inhale and as you exhale twist over to the right taking left elbow outside right thigh. Inhale to center and exhale to twist other side. Repeat the sequence five times on each side. How it works: Because your head is below your heart in this pose, blood is able to easily circulate throughout your body and fluid is able to filter out your lymph nodes. The bending motion also helps with digestion. How to do it: Stand with your feet about four feet apart, with your heels slightly farther out than the toes. Interlace your hands behind you, pressing your palms together. Take a deep inhale and bend forward at the waist, lowering your hands as far forward as you can. Take five deep breaths and engage your legs to come back to standing. How it works: Shoulder stand pose is an inverted position, so it allows accumulated lymph fluid to drain from the legs and upper body. Inversions help the immune system and also increase the metabolism as they stimulate the thyroid gland. How to do it: Start lying down on the floor, legs together and bring your legs back over your head, reaching your toes to the ground for Plow Pose. Bring your hands to either side of your spine, bend your knees and press your feet up into the air. Pull your belly into your spine and gaze towards your toes. Lower to Plow on your way down and come back to starting position. How it works: In a heart-open position like the Reverse Plank Pose, your lungs are able to fully expand and contract. Deep breathing pushes the body to rid itself of carbon dioxide, lactic acids, lymphatic fluid, and other wastes. How to do it: Start sitting on your mat with your legs together in front of you, and your hands a few inches behind your waist pointing forward. Bend your knees placing your feet on the floor, exhale and press your feet and hands into the floor, lifting your hips as high as you can into reverse tabletop position. Straighten your legs one at a time, without loosing the height of your hips. Press your shoulder blades against your back torso and lift your chest, slowly dropping your head back. Hold for thirty seconds and come back to seated position. 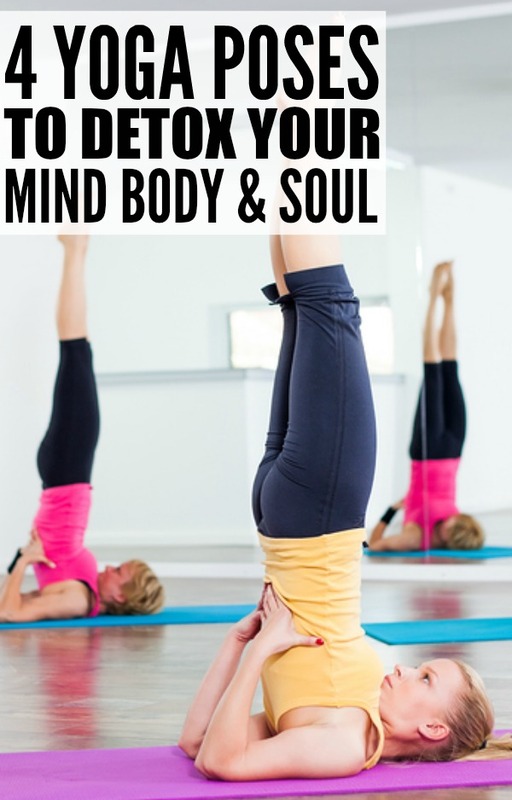 If you found these yoga poses to detox your mind, body and soul helpful, please share them on Pinterest! And if you’re looking for more health-related tips to start (or end!) your year off in the healthiest way possible, please follow our Health and Fitness board where we share all kinds of great ideas!